Dubizzle – the leading classifieds platform in the UAE – has released its 2015 jobs report, detailing key UAE job market trends including the top five industries searched for, the top five nationalities searching for each profession and a breakdown of the labour force by age. “We have found that accounting and secretarial generated to most number of ads in 2015, while also bagging top spot for most applicants in Dubai and UAE as a whole. When looking at the nationalities of those searching for a job on dubizzle, Indians, Pakistanis and Filipinos are the top searchers, while 26-30 year olds are the age group using the dubizzle job section the most. Our annual report never fails to reveal fascinating insights into the changing market of the UAE employment landscape.” said Ann Boothello, Product Marketing Manager at dubizzle. The top sector listed on dubizzle’s job section in the UAE last year was accounting, with over 38,000 individual ads posted and a staggering 10 million applicants vying for the roles. The secretarial and sales sectors follow, with more job ads posted (42,000 and 77,000 respectively) but fewer applicants (5 million for secretarial posting and 4 million for sales jobs). More than 33,000 jobs were posted last year in real estate, with just over half a million (522,000) applicants, while the transportation sector followed with fewer ads (22,000) but more applicants (825,000). In Abu Dhabi, accounting reigned supreme as the most listed sector on dubizzle’s job section, but unlike Dubai (which mirrored the UAE results), this was followed by hospitality/restaurant jobs, secretarial, sales and medical/healthcare jobs; the latter highlighting the UAE government’s significant investment into Abu Dhabi’s healthcare industry in recent years. The top five nationalities searching for sales, logistical distribution and government administrative positions last year were, in order, from India, Philippines, Pakistan, Egypt and Sri Lanka. Nationalities keen on jobs in the secretarial, hospitality, customer service and food and beverage sectors were Filipinos, Indians, Pakistanis, Egyptians and Sri Lankans. Accounting positions were most popular amongst Indians, Pakistanis, Filipinos, Egyptians and Sri Lankans, and the top job seekers looking for positions in banking and education were from India, Pakistan, Philippines, Egypt and Jordan. Finally, Indians, Filipinos, Pakistanis, Egyptians and Jordanians were also keen on positions in the construction, marketing/advertising and human resources. According to dubizzle’s data, there are over 3.4 million visits to the jobs section monthly, the majority of whom are aged 26 to 30. The 2015 dubizzle job report also delved into employer/employee communications, revealing the most common questions put to potential employees. 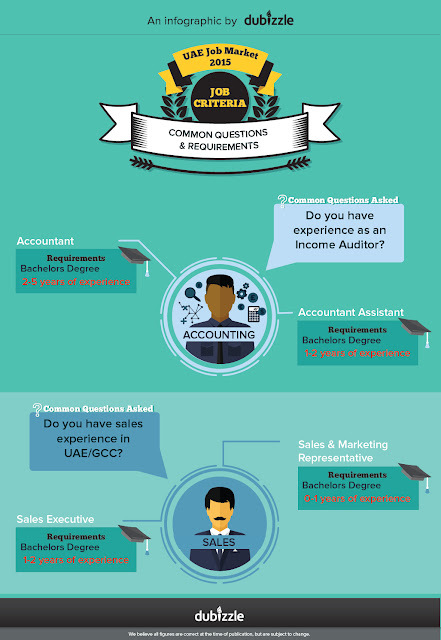 For example, the most popular question asked of an accounting job seekers was: “Do you have experience as an Income Auditor?” while for sales, most employers enquired about previous sales experience in the UAE and GCC. Each position listed on dubizzle requires varying levels of experience. 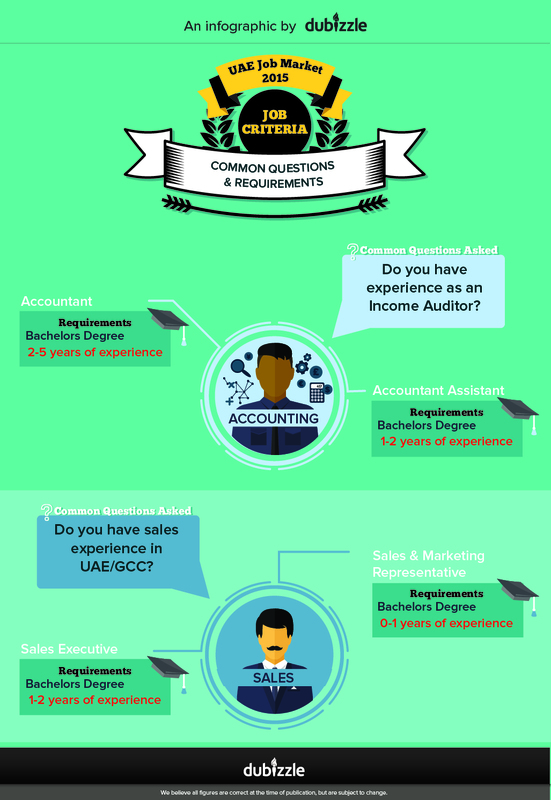 The report results reveal, for example, that in accounting, graphic design and beauty and dental, the majority of positions ask for two to five years of experience whereas jobs in the sales, nursing, administration, real estate, transportation and hospitality sectors primarily require one to two years of experience. On the other end of the scale of experience, the majority of the postings in the engineering sector require two to five years of experience; while potential civil engineer employees require up to five to ten years experience. ● Working 40 hours a week from age 20-65 will take up 90,000 hours of your lifetime. ● The average length of an interview is 40 minutes, 33% of 2000 surveyed bosses indicated they know within the first 90 seconds if they will hire that candidate. ● 93% of recruiters are likely to look at a candidate’s social media profile. ● Leonardo Da Vinci is credited for writing the first resume.